Kitchens Are Monkey Business: Warning! This Post Comes With A Disclaimer. well, any of you with a taste bud. the children, the elderly, and the faint of heart. for sending me the link. I have a collection of "vintage" recipes for you. "Dinner in a Dish," published in 1965. This delightful dish is described as "pretty as can be!" Stir in tomato sauce, vinegar, and seasonings. Fold in celery, olives, and onion. Pour into cooled Cheese Pie Shell. 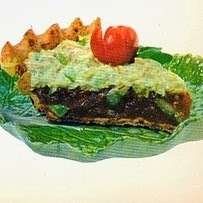 Spoon Tuna Salad on top of pie. 1 TB at a time, tossing lightly with a fork after each addition. Gather dough into a ball. roll out 1" longer than inverted 9" pie shell. Lightly mix tuna, lemon juice, onion, and celery. Season with salt and paprika to taste. Just before serving, drain and mix in just enough mayonnaise to moisten. Lightly butter a 2 quart, shallow baking dish. Peel bananas and sprinkle each with 1/2 tsp lemon juice to prevent darkening. Spread ham slices with mustard. 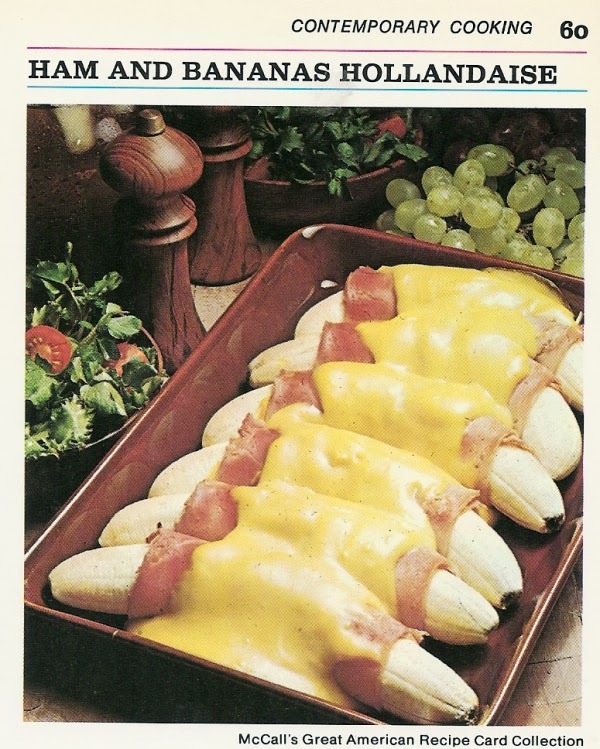 Wrap each banana in slice of ham. Arrange in single layer in baking dish. Make sauce: Combine sauce mix with 1 cup water, 1 TB lemon juice, and cream. Bake 5 minutes longer or until slightly golden. I don't know about you, but I'm doubling this recipe. And it uses packaged hollandaise mix! Now this next recipe perplexes me. and frankly, (heh) I don't think I'm able to follow the instructions. Look at the illustrations for cutting a damn weiner. I don't think a rocket surgeon could figger this out. and, for the life of me, I can't find any fondue here. The blue and red mushrooms in the back - salt and pepper shakers? There's some green (lettuce?) in the background. Then there's some orange. No idea what it is. Something black is lurking next to the orange. tomato half stuffed with brown crud (hamburger?). There's some unidentifiable yellow stuff in front (squash, potatoes?). And there are the two arthritic hot dog spines. I present to you ... Perfection Salad! to the words "perfection" and "salad." 1. In small saucepan, combine gelatine, sugar, and salt; mix well. 2. Add 1 cup water. Heat over low heat, stirring constantly, until sugar and gelatine are dissolved. Remove from heat. 3. Stir in apple juice, lemon juice, vinegar, and 1/4 cup cold water. Pour into medium bowl. Refrigerate 1 hour, or until mixture is consistency of unbeaten egg white. 4. Add carrot, celery, cabbage, green pepper, and pimiento; stir until well combined. 5. Turn into decorative, 1 1/2-quart mold. Refrigerate 4 hours,or until firm. 6. To unmold: Run small spatula around edge of mold; invert onto serving plate. Place hot dishcloth over mold; shake gently to release. Repeat, if necessary. Lift off mold. refrigerate until ready to serve. Truth be told, I actually have a Devo hat mold. I'll have to find that sucker and make this for you! I give you Frosted Ribbon Loaf. Oh, what a festive presentation! "It's strictly for company and simply delicious!" What, you mean you can't serve this to your family???? to reveal pretty layers of ham and egg filling. Tomato rose is fitting trim." Slice bread lengthwise in 3 equal layers. Spread first slice, buttered side up, with ham filling, second slice with egg filling, ending with thrid slice. Wrap in foil and chill. At serving time, beat cream cheese with milk until fluffy. Frost top and sides of loaf. I really have no words for this one. Looks like it's gonna crawl off my plate and eat me. I recognize shrimp and green olives and lettuce and nothing else. As I said, it's scary. the green oozing out of the middle! Dissolve gelatine in hot water, add vinegar, sugar, pepper, and salt to taste. When quite cool, place a little in the mold and turn the mold until it is entirely masked with a thin film of jelly. The coating may be thickened by adding more of the mixture and repeating the process. Arrange shrimps or other decoration. Mash the pulp from a small cucumber. Add gelatine dissolved in hot water and add salt to taste. When cool, stir into cream and strain. Color a delicate green. Pour carefully into the mold. 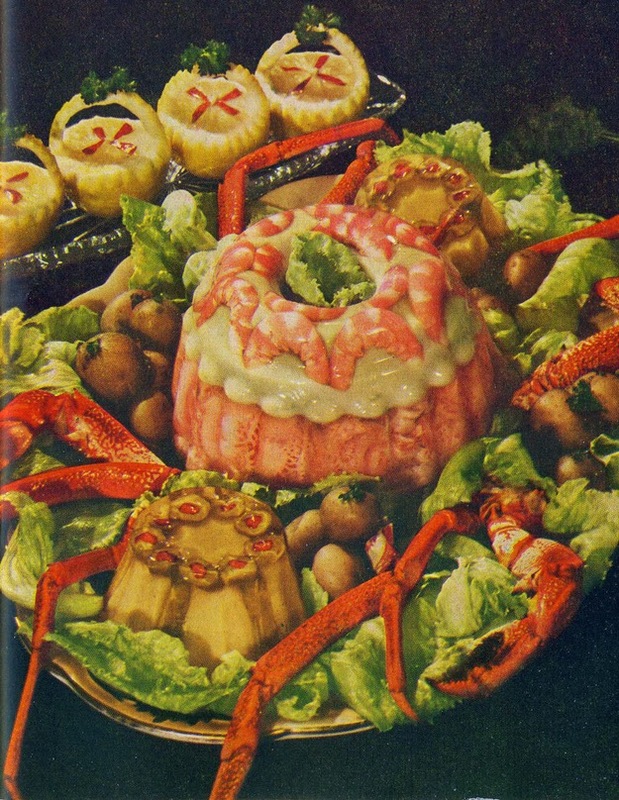 When firm, pack the lobster meat into the mold and add the clear jelly. Serve with jellied mayonnaise. Dissolve gelatine in hot water. Add to mayonnaise. Pour into small molds. I love the direction to "color a delicate green." who says to use 1/2 pint or 1/4 pint? A pint is 2 cups. 1/2 pint is 1 cup. 1/4 pint is 1/2 cup. Now, are you ready for a little palate cleanser? 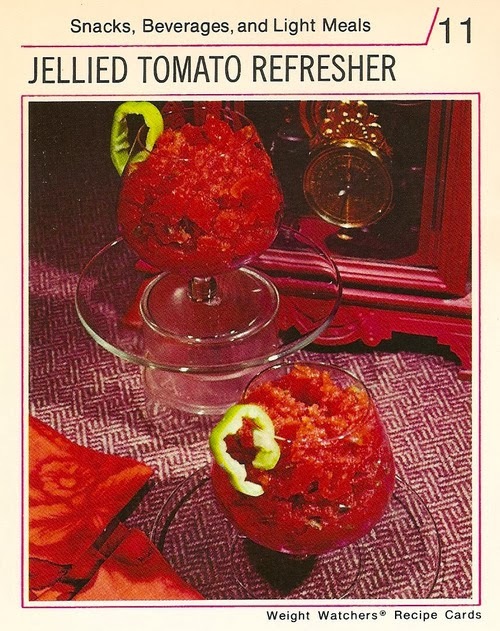 By golly, it's a Jellied Tomato Refresher! Sprinkle gelatin over cold water to soften. Combine tomato juice, green pepper flakes, sweeterner, lemon juice, broth mix, Worcestershire, garlic salt, and cloves in saucepan. Bring to boil, then remove from heat. Add softened gelatin and stir to dissolve. Pour into bowl. Refrigerate until set. Just before serving, beat lightly with fork. Spoon mixture into serving dishes/glasses. Garnish with pepper rings, if desired. when he commented on this "recipe" on FaceBook. Throw out the water and throw in the Smirnoff! The 1960s were a horrible time. It's a wonder we made it. I love this! 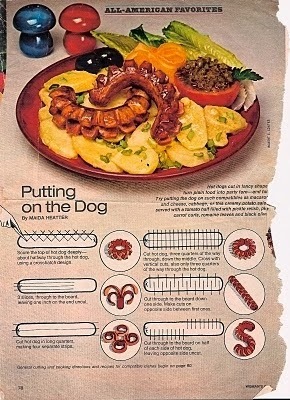 I remember my Mother making "fancy" foods like this. Though none of these exactly. She has a gazillion congealed "salad" recipes. 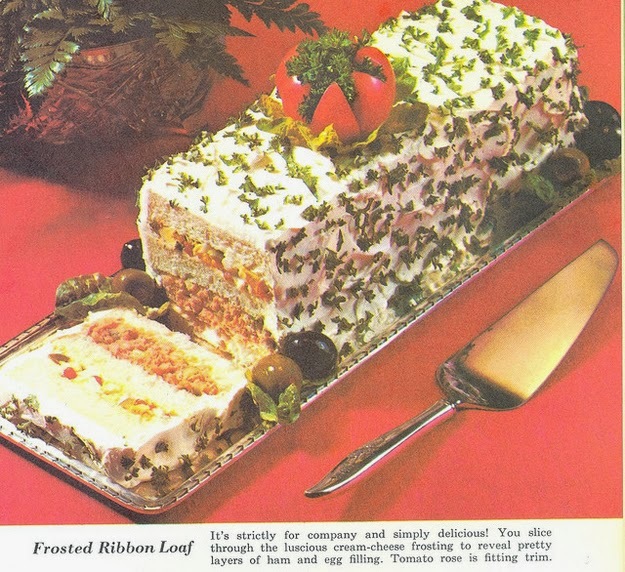 If I had to eat one of those, I would choose the frosted ribbon loaf. And I don't know which would be worse, the first one with the tuna salad and jello layers, or those weenies. My family still makes that perfection salad. Well, with lemon or lime jello not the plain with lemon juice. But with the same vegetables. My mother CRAVES it several times a year. I don't consider jello to be food unless I am prepping for a colonoscopy....so I don't eat it. Blech. Glad you enjoyed the retro trip, Sage. If you "had to eat one." Hahahaha! Did you mean at gunpoint? I'm sorry, Lea, but I don't see the "perfection" here. And I don't eat Jello either. Not even for a colonoscopy. Interesting, Lea, that you came up with "colonoscopy" after reading this post. Brings to mind a concoction Mama made when we were growing up. Called Luau Weenies, it had a sauce made of ketchup, yellow mustard, oil, sugar, brown sugar, vinegar, sliced green peppers and onions to which sliced hot dogs were added and simmered until heated through. Recipe instructions were to serve "piping hot" over white rice. Will have to admit it was one of my favorite meals in those days, but don't think I'd have the nerve to try it now! Oh, Tortietat, stop. Stop! Stop! I can't take this any more. Only if you never want said company to never come over to your house again! 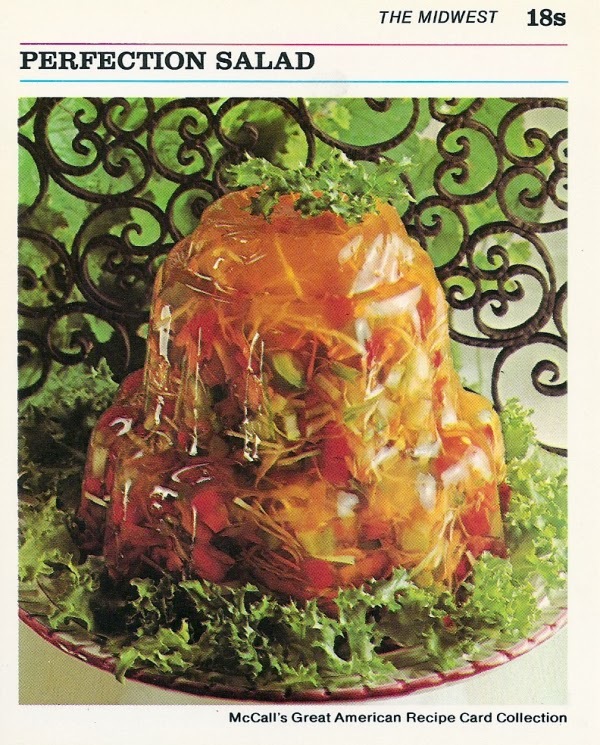 I remember the salads in jello molds showing up at potluck dinners and for holiday dinners with the family. I always thought that was a horrible way to ruin both jello and salads. Although, with food like that, it's easy to see why people were thinner back then; who would want to eat that stuff?